We are pleased to announce that Erik Carlsson and Peter Bäckström very kindly unveiled our Neo 96ss at the International Saab Club meeting which was held at Wicksteed Park on 3rd – 4th August 2013. The car was well received by the guests at the event and we had much praise and congratulations on our achievement. The recurring question was “When will it go on the track?” In an ideal world, we would like to drop all the other work and concentrate on testing and adjusting the 96ss but, common sense and commercial reality must prevail which means that we must concentrate on the final stages of the transfer of stock into our new warehouse. Having said that, we ‘really want’ to test it on the track by October/November of this year so that it can be properly ready for action next year. Watch this space! The Intsaab 2013 Kettering event was a resounding success – even the sun was out for most of the time. To celebrate the 50th anniversary of the Saab Owners Club and the international Saab Clubs meeting, this year, we went to town on the Neo Brothers stand. It entailed a 150 square metre marquee, our hospitality rig and a further external area of some 150 square metres of forecourt space which housed numerous cars three of which were our race cars including the 96ss, the Grinnall as well as two of our customer’s cars that we have over the years customised. In addition to the cars on display, we had a large selection of new Saab parts for sale as well as Saab Expressions clothing, accessories and memorabilia. There were in excess of 20 of our staff on hand in order to look after our guests and customers. Indeed we were congratulated by the organisers of the event for the largest stand ever in the history of their various meetings – the acknowledgement is appreciated. We would like to extend a very big thank you to all our customers, supporters, Saab enthusiasts, sponsors and organisers that all contributed to the success of the event. Please see below the link to our photo album where our photographers captured some key moments. We are looking forward to Poland next year. 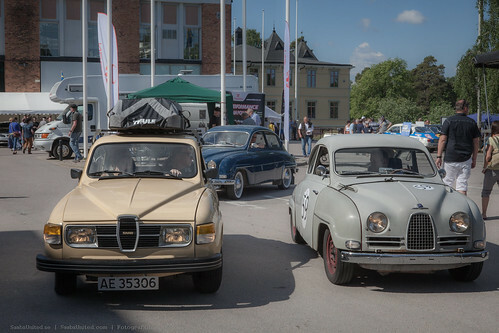 I have even more photos to upload, but lets start with these..
Just in case a few of you want to see more pictures from the Saab Festival 2013. I have put all mine from the whole weekend onto my flickr site. It was a brilliant weekend from the moment we landed in Gothenburg on Thursday until we departted on Monday. Fantastic to meet so many people, many I knew from all over the world and new ones too. Envall design on Saab Car Museum coffee table. My first Saab festival or Saab Jubilee as it was called was way back in 1987. Still remember driving my olive green 1966 MonteCarlo V4 back to its birthplace. This was way before the present time museum etc. We met at the gravel parking lot near Saabs Training and fitness center just south east of the production plant. I will not bore You with this history in details but the highlights was at that meeting the Monster driving and reving its 6 cylinders and the first show in 22 years of chassis number 4. More on that car in particular later in this write-up, since it reappeared at this years festival (have a nice interview with the present owner). The crew of the SaabsUnited had done extensive preparations Till printing stuff, Tim erecting tents and so on. Most of the crew met on thursday night having alight dinner and drinks near the channel in Trollhättan. I had driven down in the afternoon top down in the convertible in the 35 Celsius degree temperatures, stopping by in Örebro to talk with our friends at Maptun. It turned out also to be gathering point for two other companies RBM from France and Neo Bros. UK. Fridag morning the Festival gradually started whit cars and people rolling in from the whole world, so many nationalities and great know and not so know Saab people. In a randomly taken video shown here You can pretty much see how international the crowd was. I could count US, Canada, Israel, Italy, France, Switzerland, Austria, France, Belgium, Holland, Germany, Estonia, Great Britain, Poland, Check Republic, Slovakia, Bulgaria, Russia, Finland Norway and Sweden. If I have missed any nation here make Your voice heard in the comment field. The theme this year was Sport & Rally. That was the name and logotype created by Saab in conjunction between the marketing and competition departments in the 70 ies by Saab to market the BIG aftermarket tuning and development parts and kits even complete engines and gearboxes aimed for customers competing or just wanting to make their standard Saab just a little or much faster and agile on the roads and out in the forest. Successful then at the time when the only electrical accessories would have been the co-drivers map reading light…. Today it is the other way around when “tuning” and tweaking modern turbo monster up to 1000 BHP just like the white 9-3 SS shown by Mr. P-A. Some more notable historic competition Saabs where on display. A 96 V4 ex-finnish works team driven en by Simo Lampinen, http://youtu.be/midWjYw5pUY , Anders Norstedt had brought his 99 Turbo replica of Saab works notchback from 1979. Another unique car that showed up and placed far away of the museum was Lennart Nilsson´s V4 Rally works car that Stig Blomqvist drove in Swedish Rally 1971 ( see pictures). Nico Gasparatos brought his 900 track car he have competed in with Per Eklund on german tracks Tidö Racing team and their Norwegian driver had the STCC racer on display on saturday afternoon. For the good of increased general knowledge of Saab a nice list of lectures could be attended, listening in on the past and a little bit of the future. Remember the mentioning in the beginning of chassis #4 92. I had a chance to talk to the brother out of three who have owned and owns that very car. Lennart Gustafsson bought the car from his brother who bought it in 1965 after the car had been modernized with a trunk door. The engine was not so good after having had too little oil in the gas so the cat was put 100% unrestored into the business office room in St. Levene not far from Trollhättan. The brothers where all active in the car sales and the car was brought out of the office for the Jubilee in 1978. First time the Saabworld got to see the car again. Now again 25 years later out in the sunshine. Lets hope we do not have to wait another 27 year to see it again. The interview is mostly in Swedish and It happened to be parked just next to a NG 9-5 SW. That sportcombi could be the 4th car from the end of production who knows. Talking about the future and the question many Saab owner has; what will happen to Saab? When will production start etc. etc? I had a handful of really good talks with people working both for NEVS and subcontractors and the puzzle I have laid in my head is very promising of course some bits are not present and some bits might not be in right place but the overall picture is really good. We will look forward to car production in Trollhättan again. New state-of-the-art technologies is tested an couple of promising patents on engine technologies is in the pipe. My personal feeling is that Saab is truly is rising again (under new stewardship), who said that the Saab had more than 9 lives? The festival was drenched in sunshine and no rain, but that is just what a Saab Festival is al. So what is next? More festivals? For sure there will be in the future. Looking forward to a REALLY big meeting/jubilee in Trollhättan 2017 when Saab celebrates 70 years of success. Looking into my crystal ball I see the following. – A range of at least 3 model lines from SAAB (NEVS Corporation) not only at display but also for sale. – A super museum for a limited time, bringing in private owned cars and from other museums of significance, that are not in the museum collections and have that show. – Create a Saab Fairground (the largest grass lawn) in Trollhättan with plenty of space for a array of activities for young and old. – Track day at the KinneKulle Ring racetrack just like at some previous festivals. Saabs are meant to be driven…. A BIG thank You to all the nice people that came to Trollhättan with and without Saab cars, You are the people that made up the Festival. I wanted to share with you a short video I recored of the convoy of Saab 9-5 II Wagons as they went from the museum to the factory on the Sunday of the Festival. I hope you agree its a beautiful site. Just press play or a full size version will appear by clicking the image. For some time now Till Drescher has been working his tail off trying to get a shop up and running that will specialize in SAAB treasures for all of us. When I say some time, this has literally been something we have been discussing since even before the calendars were printed last year. Along the way we have had many conversations with each other and the website as it will be would never have happened if not for the help of our late friend Nic Schellekens who spent countless hours on the backend of the site and chatting of different ideas/solutions and was so excited to see this finally be completed. So after a bit of a break from working on the Card Your Car website and products, we are now able to introduce everyone to the website and for everyone attending the SAAB Festival, Till will be on hand with posters, stickers and wrapping papers. For the SAAB fan that wants it all, CARDYOURCAR has also come up with some wrapping papers to make that SAAB gift even more special. If you’re at the festival, stop by the SAABSUNITED tent where there will be posters and all sorts of goodies for sale from CARDYOURCAR and SAABSUNITED. Prices are beyond reasonable as well with posters being just 5 Euro and wrapping papers being only 5,50 Euro. There are 12 different posters with some of the classic Mioh photos like what we saw in the calendars offered earlier in the SU store as well as 4 different wrapping papers that highlight some SAAB classics. Lots of future plans with the store as well including ways for you to do as the name says and card your car. We will introduce so many things in the coming months and if you ever wanted a poster of your own car, the wait is almost over and I applaud Till for getting this dream to be a reality. The group from Germany is currently on their way to Trollhättan with approximately 40 SAABs in their convoy. Till Drescher from SAABSUNITED along with REDJ are a part of this convoy put together by Markus Lafrentz from Autohaus Lafrentz. This is unreal how well organized this is, as you can see by the photos attached, they have met at the dealer and then moved on to take over a large portion of the ferry to bring them over. Till tells me there are 4 9-5 combis and a 9-4X as well as a lot of other specials, some of which you can see below.